Riders will meet at 5:45 in the parking lot across from 2nd Beach just as you head into the park. 6pm hard start. Threshold is just another word for pushing your comfort zone. So whether you’re learning a new skill, improving on another or pushing yourself physically, nudging your edge and challenging yourself is always a good thing. Embrace the discomfort because that is where the real learning begins. 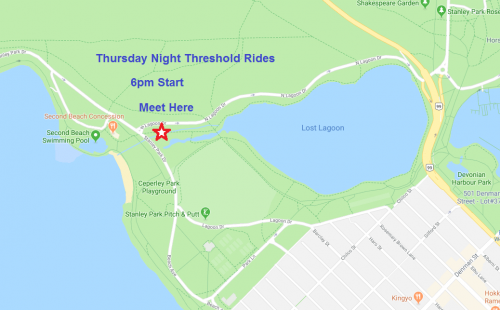 Thursday night rides will be non-lead rides around Stanley Park. This is a great opportunity to hone your skills, challenge yourself and connect with other like-minded ladies. Choose your mood and goal and ride as little or as long as you like. Riders will be divided based on ability, experience and distance preferred. Please click on this link to review “How to ride in a Group Paceline” .